There is an epidemic of foot issues among our politicians. First it was Hillary Clinton, who was fitted with a medical “walking” boot on October 15, ostensibly for a broken toe from “running downstairs wearing heels” and “falling backward”. Two months later, seen at an appearance in Vancouver on December 14, Hillary is still wearing the boot, albeit a different one, although the recovery period for a broken toe is 4 to 6 weeks. On December 21, NBC News reported that Attorney General Jeff Sessions has ordered the Justice Department to interview FBI agents with knowledge of an investigation into Hillary Clinton’s role in a uranium deal with Russia, reviving interest in what President Trump has called a “modern-age” Watergate. Sessions’ order comes a month after Republicans in Congress had urged him to appoint a second special counsel to investigate Clinton’s 2016 presidential campaign, the Uranium One deal, and the FBI’s handling of its investigation into her private emails at secretary of state. See “The real U.S.-Russian conspiracy: Russia gave $multi-million bribe to Clinton Foundation for 2010 uranium deal“. 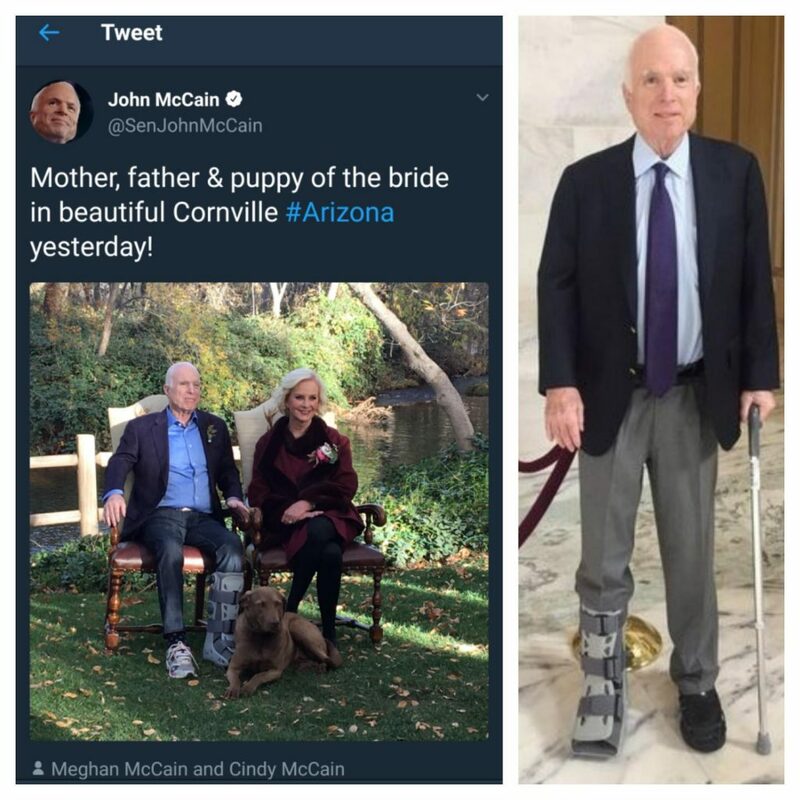 Then it’s RINO senator John McCain, who was fitted with the boot on his right leg. His office said in a statement on November 6 that the boot was because of “a minor tear in his right Achilles tendon”. Two weeks later, he switched the boot to his healthy left leg to, as he put it in a tweet, “give it a break”. Not only does it make no sense to put a cumbersome medical boot on a healthy leg, that he no longer wears a boot on his right leg means that his Achilles tendon is healed. Bloomberg reported in 2016 that Saudi Arabia donated $1 million to the McCain Institute, a contribution the Institute has refused to explain publicly. Then there is the rumor that McCain is the “Republican politician” who ordered the entirely bogus “golden showers” Russian dossier on Trump. 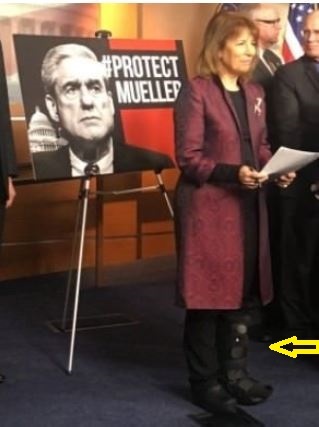 That both Hillary and McCain suddenly sported medical boots on their respective right leg triggered speculations in the Alternative Media that their boots may conceal ankle monitors. According to Garth Kant of WND, Jackie Speier is one of “three Democratic lawmakers who employed the criminal Awan brothers and who are on the HPSCI” (House Permanent Select Committee on Intelligence). As information technology (IT) staffers, the Awan brothers — Abid, Imran and Jamal — compromised U.S. national security by hacking into classified or other sensitive information of members of Congress. The FBI arrested Imran Awan in July 2017. He is currently awaiting trial on charges of bank fraud. See also “Did John McCain really die from brain cancer?“. This entry was posted in Congress, conspiracy, crime, Dept of Justice, Donald Trump, Liberals/Democrats/Left, United States, US Presidents and tagged Awan brothers, Jackie Speier, John McCain ankle monitor in walking boot, sealed indictments. Bookmark the permalink.